The History of jousting started with the emergence of Knights as a fighting force in Europe of the Middle Ages in the 10th century. The history of the tournament and jousting started as a means for knights to practise his horsemanship skills and his prowess with the use of a lance - a weapon used by knights during the Middle Ages. Tournaments and Jousting has been credited to a French man named Godfrey de Preuilly. The first recorded reference of a tournament was dated in 1066 and refers to Godfrey de Preuilly, who is described as having invented the medieval tournament. In the same year the Normans conquered the English at the Battle of Hastings. The division of English lands amongst the Normans saw the emergence of the Medieval feudal system. The feudal system demanded that everyone owed allegiance to the King and their immediate superior. Every noble was expected to pay for his land by providing the trained knights to fight for the King. The tournaments were entertainments devised by rich nobles to enable knights to practise their combat skills in mock battles or as in jousting in single combat. The history of jousting also described a form of jousting which was used in the mock battles. Lines of Knights faced each other on horseback, in full armor, and tilted their lances at their opponents. This form of jousting was called a "lance charge" which began the melee. A dangerous but spectacular sight. By the 12th century the tournament had grown so popular in England that King Henry II (1154-1189) found it necessary to forbid the sport which gathered in one place so many knights in arms and jousting contests. This was only a temporary measure but illustrates the concern regarding unnecessary injuries to the King's fighting force of highly trained Knights. Those who wished to tourney there had to obtain a license and make a payment for the privilege. Foreign knights were banned from tourneying in England. the English knights for being crude and less skilled." 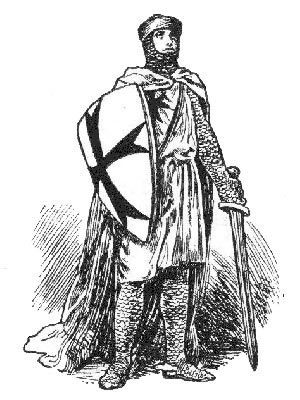 In 1292 the "Statute of Arms for Tournaments" was ordained by King Edward I (1272-1307). The 1292 Statute of Arms provided new laws for tournaments which included jousting. The Statute of Arms ordained that no pointed weapons should be used - they should be blunted. New types of lances were developed called the 'lance of peace'. The tip of this type of lance had either been rebated (blunted) or replaced by a metal crown-shaped head called a coronel, which was designed to disperse the impact of the blow during the jousting contest. In 1299 life and limb were declared to be forfeit in the case of those who should arrange a tournament and jousting events without the royal licence which had been initiated by Richard the Lionheart. Offenders were to be seized with 'horse and harness'. Jousting was used in a judicial combat. Disputes were settled according to the outcome of such jousts - the victor was seen to have God on his side, therefore not guilty, and the dispute was settled in his favour. The most skilled and accomplished knight in the realm was referred to as the King's champion. He would fight in jousting combat for his King. Edward III (1327-1377) challenged the King of France to combat between either two champions or 100 knights per side, in a combat "au outrance" meaning 'to the limits'. Jousting "au Outrance" was typically performed during wartime on battlefields and was performed "to the death" using sharpened lance tips. After 1400 the tilt was invented to reduce the injuries due to jousting. A cloth stretched along the length of the lists. The cloth soon became a strong barrier of timber. The knight in full armor would charge along one side of the barrier jousting with his opponent. The decline in jousting started with the invention of the musket firearm in 1520. The skills required in Tournaments and jousting were changing as technology advanced and new weapons were introduced. A Jousting event resulted in the death of the French King Henry II (1519 - 1599). Henry II was an avid participant in jousting tournaments. A jousting tournament had been arranged by the King to celebrate the Peace Treaty of Cateau-Cambresis and to celebrate the marriage of his daughter Elizabeth of Valois to King Philip II of Spain. On July 1, 1559 King Henry participated in a jousting contest against Gabriel Montgomery, captain of the King's Scottish Guard. The eye of King Henry was pierced by a sliver that penetrated the brain, from the shattered lance of Montgomery. The injury was terrible and he died an agonising death despite the efforts of the royal surgeon Ambroise Pare on July 10, 1559. Earlier fatalities at Jousting Tournaments included the death of Geoffrey, Count of Brittany, Son on Henry II, who waskilled in 1186 and Leopold, Duke of Austria, who was slain by a fallen horse in 1194. Tournaments and jousting were merged with magnificent pageants and state occasions. A great tournament and jousting events was arranged following the marriage of King Henry VIII and his new Queen, Katherine of Aragon. The arrest of Henry Norris occurred following a tournament attended by King Henry VIII and his second Queen, Anne Boleyn. Sir Henry Norris was accused of being a lover of Anne Boleyn, was found guilty with several other men and like Anne Boleyn herself was beheaded. Pageants and Jousting were still popular in the reign of Queen Elizabeth I. Sir Henry Lee was Queen Elizabeth's first champion in the tilt-yard of Whitehall and was followed in this role by the Earl of Cumberland who wore the Queen's glove pinned to the flap of his hat. The decline in jousting had started with the invention of the musket in 1520. The history of jousting moved an as forms of lavish entertainment and a venue where courtiers could show their skills in jousting and their horsemanship. Tastes in entertainment changed. The period of the Renaissance with new ideas in art and literature was developing. Renaissance men such as William Shakespeare emerged and the Theatre was born. The theatre and the lavish costumes, surroundings and plays were the new form of entertainment and contributed to the decline of jousting. The decline of jousting in England occurred at a faster rate than the rest of Europe - due to the development of the new entertainment offered in the theatre. In France the notions of Chivalry continued tournaments and jousting into the seventeenth century - these were also referred to as Carrousels. The word Carousel is derived from the words "garosello" (Italian) and "carosella" (Spanish), both of which mean "little war". The origins dated back to the time of the crusades when a carousel was a horseman's game in which cavaliers pelted each other with balls. The "carrousel" was a ring-spearing tournament in which expert riders used their lances to spear small rings suspended between two posts at full gallop. Young French princes trained for this type of tournament by sitting on wooden horses which were attached to a center pole. The young nobles would attempt to spear small rings dangled along the outer edge of the device. To make this more difficult the device was powered round and round by a horse or a servant. The device was soon referred to as a carousel. This history of Jousting remains with us today at fairgrounds in the form of the Carousels! Each section of this Middle Ages website addresses all topics and provides interesting facts and information about these great people and events in bygone Medieval times including History of Jousting. The Sitemap provides full details of all of the information and facts provided about the fascinating subject of the Middle Ages!